Since then, he has focused his time on his current project, the Kieron Garrett Quartet, which led the way to the consequent release of his debut Album of original material, "It's Time". Kieron has had a wealth of both studio recording and live gigging experience, playing at the majority of the most famous jazz clubs in London including the 606 Club, Bull's Head, Jazz Cafe Posk, Forge and Boaters Inn and sharing a stage with such players as Jay Phelps, Arun Ghosh, The Shez Raja Collective, Tony Woods, Scott Garland, Duncan Eagles and of course, Dave O'Higgins. Kieron is currently writing material with Mike for the second album, set for release next year. Dave has toured all over the world and recorded 14 albums as leader. He began with John Dankworth and Cleo Laine, Mezzoforte and later Jim Mullen, Ray Charles, Martin Taylor, Itchy Fingers, Frank Sinatra, Salif Keita, Jimmy Smith, Joe Locke, Kyle Eastwood, Jamie Cullum, Stan Tracey, Ronnie Scott’s All Stars, Matthew Herbert, and the BBC Big Band to name only a few. 'The Two Minds Big Band', due for imminent release, is co-led with Pete Wraight (MD with Matthew Herbert). The band has recorded tunes written and arranged by each leader with the same title as inspiration. Dave has recorded two CDs with US saxophonist, Eric Alexander. These are in the hard blowing tradition of Griff/Lockjaw. 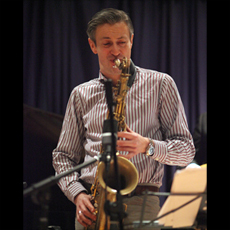 He also teaches saxophone, harmony and improvisation at the London Centre for Contemporary Music. Peter is now well into his third decade as a professional drummer. In his career over the skins, Peter has worked with a great number and variety of people; he has stood in for Cozy Powell in a Pepsi Cola advert, played with Britain’s top accordionist Neil Linden and had the pleasure of sharing the stage with violin virtuoso Nigel Kennedy. During his time playing in touring rock 'n' roll theatre shows, Peter played to appreciative audiences in twenty-six of the U.S. states, was met with "stående ovationers" on five consecutive shows in Sweden and played countless sell-out tours in the UK and the rest of the world. No stranger to live broadcast, Peter has appeared on TV for the BBC, ITV and Sky TV along with many local TV and radio shows. For a good part of the nineties, Peter was a co-producer and cast member of the show "Buddy Holly and the Cricketers" which brought the unexpected perk of playing cricket with the Bunburys. Playing charity matches with test cricketers such as Robin Smith and Neal Radford, footballers Gary Lineker and Ian Wright and even once being tackled to the ground by boxer Gary Mason to ensure that he couldn't run the last few runs required! Having always loved fusion and sharing a lot of the same influences as Kieron, Peter is now happy to be playing music he loves, in more intimate venues and to a much more discerning audience. 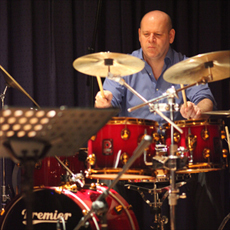 In addition to being a drummer, and a tutor to select pupils, Peter is also a sound engineer. Having recorded the quartet's album "It's Time" at Livingston Studios with Sonny, Peter was then the mix engineer, sharing the final production with Kieron. 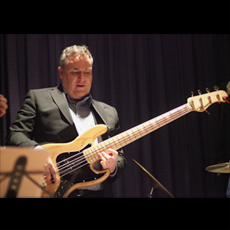 Mike has played bass guitar and double bass for over 20 years, sharing a stage with Liane Carroll, Simon Carter, Martin Shaw, Scott Garland, Dave O'Higgins and Duncan Eagles. 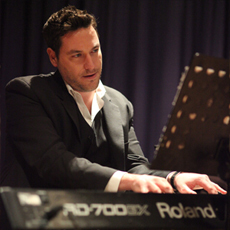 He has performed at some of the most famous clubs and concerts halls in the country, including the 606 Club, the Jazz Cafe, the Albert Hall and a bi-weekly spot at Ronnie Scott's. Mike has also taught bass and composition at Kingston University.